Here’s an very interesting article by Jim Hingst with RTape Corporation. 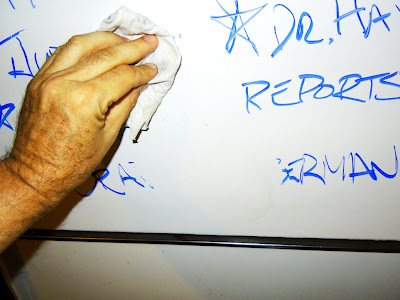 As an alternative to Dry Erase, try SEALs Anti-Graffiti film and this preparation is not needed. Great tip Jim! Ghosting on dry erase boards is usually the rule, not the exception. If you want your dry erase board to look good years from now with minimal ghosting, you have to condition the surface, before you use it and you have to use the right markers. I have used the RTape EZErase™ film on my refrigerator for two years. The surface is as white today as when I applied it. In fact, it is a brighter white than the white of the refrigerator. The Rain-X® Fast Wax forms a protective barrier between the surface of the EZErase™ dry erase vinyl and the ink of the dry erase pens. After waxing the surface, I recommend writing on EZErase™ vinyl with the Quartet® Enduraglide® pens or the RTape dry erase pens. 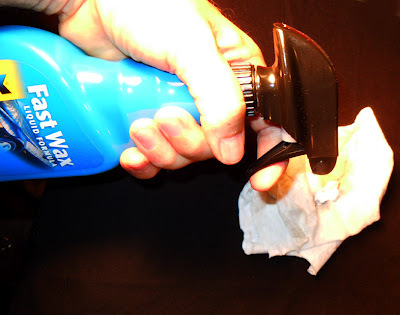 To clean off the writing on EZErase™ vinyl, squirt a little Rain-X® Fast Wax on a cotton cloth. See the photo below. 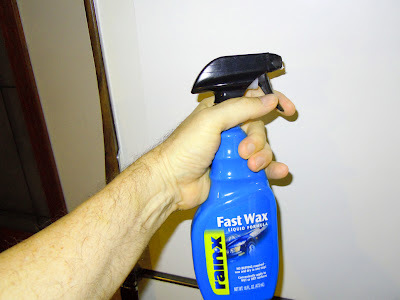 With Rain-X® Fast Wax the writing wipes right off leaving no telltale ghosting. See the picture below. I can’t promise you that EZErase™ will never ghost. I don’t know what dry erase board that doesn’t show ghosting or signs of aging after years of use. I can only report on the results that I have experienced and recommend that you give it a try. To contact Jim Hingst, write him at hingstjim@gmail.com or at Jim Hingst, PO Box 671, Chesterton, IN 46304 USA. For immediate assistance, call RTape at 1-800-440-1250 or 908-753-5570. Posted on January 3, 2014, in graphics and tagged anti-graffiti, dry erase, laminating, SEAL. Bookmark the permalink. Leave a comment.